It’s legend that King Midas was able to turn everything he touched to gold, luckily for us that legend has now passed on to his daughter. NextGen Gaming have been gracious enough to share the knowledge of her power with you and in turn her riches. Her name is of course Miss Midas and alike her father before her, she is going to be lucky for some of you. 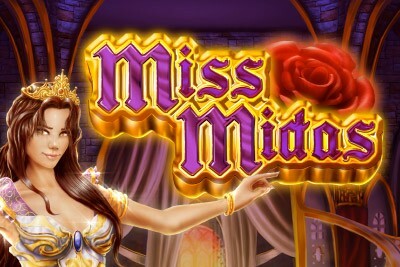 Miss Midas is a 5-reel, 25 fixed pay line slot, which offers a variable RTP of 95.3% to 95.62% for players with the golden touch. The game is set out in what looks like the throne room and is very lush and bright in design. Symbols include a peacock, rose, fruit bowl and a throne for your higher paying and your usual A, K, Q, J, 10 and 9 making up your lower paying symbols. Miss Midas also is running on the NextGen Gaming superbet platform which will be explained a little bit more below. Bet Amounts – Betting begins at 50p per spin and can be increased to £50 which is the maximum stake allowed. To the right of the reels you will see a row of coins, this is where you amend the bet up and down until you reach the stake you wish to play at. Wild Symbol – Miss Midas is the wild symbol and she will substitute for all others except the scatter. She will only appear on reel three and does offer line win values if you land 3 or more on a winning line, but she is not the highest paying symbol in the land! Miss Midas wilds do however have a vital role in the Golden Touch feature. Scatter Symbol – The royal palace is your scatter symbol and landing three or more of these anywhere in view will trigger the bonus spins. It is also you highest paying symbol in the game and will award a x2,500 coin win for landing five of these on a winning pay line. Superbet / Golden Touch Feature – We mentioned earlier the NextGen Gaming superbet feature, which is a way of enhancing your bet amount to increase win chances. When the Miss Midas wild symbol lands, depending upon what superbet level you are at she will turn certain symbols wild that are adjacent to her when she lands. 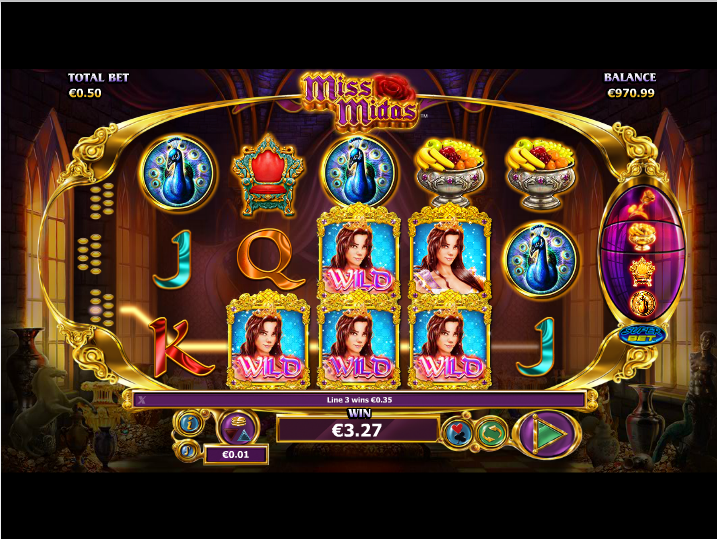 Superbet level 3 – Miss Midas will turn the peacock, throne, fruit bowl and rose symbols wild. Each level of superbet that you increase will also increase your cost per stake, but it will also increase your RTP as well, so it balances things out. 5 palace scatter symbols will award 25 bonus spins. If the superbet function is activated when the bonus spins begin then you are in for an extra treat. With the superbet enhancement every wild symbol that lands will turn a neighbouring one wild also, that’s handy isn’t it? Bonus spins can also be retriggered by landing three or more palace scatter symbols during the round! Miss Midas really does have the golden touch, and unlike her father before her she knows how to share her wealth. Gameplay is fast paced and enjoyable which is something we have grown to expect from NextGen Gaming. The addition of the superbet feature makes an already great game even better and we thoroughly enjoyed playing Miss Midas. We would definitely advise to have at least level 1 of the superbet activated where your funds allow, as this means that when the bonus spins kick in you are getting those extras too. However, there is no need for the superbet to gain the wins in the main game as they happened often enough without the enhanced options.